Beautifully engraved certificate from E. H. Heaps & Co. Limited - British Columbia, Canada 1911 This historic document has an ornate border around it with 2 eleven Shilling Revenue Stamps on its face. 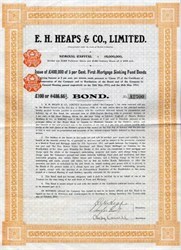 This item has the signatures of the Company’s Directors, including the founder E. H. Heaps and is over 94 years old. The first settler in the area that became known as Ruskin arrived in 1887 to clear land for a farm. Along with farming, logging was among the first endeavours undertaken by the early European settlers in the area. The name "Ruskin" was given to the community by the Canadian Co-operative Society, a group of settlers inspired by the socialist ideals of John Ruskin, a communal socialist from England. Lumber Industry in Early Mission: In the early 1880's most of the areas logging operators were located within the reach of local rivers and produced ties and sleepers for the railroad. In 1898, E. H. Heaps & Sons took over operation of the failed sawmill operation of John Ruskin on the Stave River. Ruskin was originally considered part of Whonnock before the establishment of the Ruskin Post Office in 1898 gave it the status of a separate community. The Canadian Co-operative Society established a sawmill in the area, inspired by their belief in a system of joint ownership. The Co-op also founded the first school near their mill just prior to 1898. However, by 1899 the society found themselves unable to maintain the sawmill, and it was taken over by their major creditor, E.H. Heaps & Sons. E.H. Heaps & Sons, the company who took over the Ruskin sawmill in 1899, worked during these years to develop a community at Ruskin to support their mill. The company's hotel, store, and offices soon became the central part of the community. In 1910, the E.H. Heaps & Sons company had built a log dump which allowed them to clear the forest more efficiently and move logs using a logging railroad that they had constructed in 1909 and 1910. The company took advantage of the construction of the Stave Lake Power Plant in 1912, constructing the first all- electric mill in British Columbia. The electric mill changed the face of saw milling in Ruskin, turning it into a large-scale commercial operation. E.H. Heaps & Sons was unable to make the payments for this modernization and the company went into receivership in 1913, when Abernethy & Lougheed took over the Ruskin operation. Other mills also developed in the community in these years, as did the berry growing industry. In response to the growing population, a two-room school was constructed in 1916. The school was moved in 1923 and eventually became the community hall. The primary livelihoods of people in Ruskin between 1926 and 1950 were berry farming and work at the lumber mills. There was a large population of Japanese settlers in Ruskin, who operated berry farms. Much of the land was cleared to support these operations. The E.H. Heaps buildings, which had formerly been the centre of the community, burned down in the 1920s, leaving the community without a recognizable social centre. However, the community gained an important icon when the Ruskin store was built in 1926. This business assumed the social and economic roles that previously had been held by the E.H. Heaps buildings. The opening of the Ruskin dam in 1930 was an important event in the area because it provided much needed power to the growing population and industries located in the Fraser Valley.